Use the Service Hub to request technology help or services. You can also report an issue or problem. Click the blue "Chat now" button at the bottom-right of your screen. 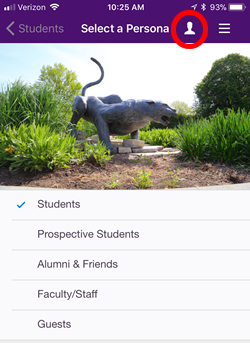 The MyUNI mobile app has several features to make it easier for you to use. When you log in for the first time, you're asked to select your Persona, which is audience-based navigation. 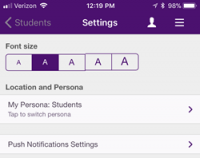 If you're a current student, the Students Persona has icons and features specifically for students. Faculty/Staff has only the icons pertaining to them. For instance, they don't have the Laundry feature, which only applies to students in the residence halls. You may change your Persona at any time by selecting the icon in the upper right corner or the Settings button in the Utility Bar at the bottom. On the Utility Bar near the bottom of the app, you'll find the Edit Favorites button. If you click on it, you can select your favorite features of the app by clicking on the + sign. When you go back to the main screen your favorites will be in a light grey box at the top of the app screen. You can arrange your favorites in whichever order you prefer. (favorites not available for the Alumni & Friends persona). With the new app, we have the ability to send messages to either all users of the app, or just to select Personas. You have the option of enabling Notifications on your smartphone to receive these messages with your other notifications, or to only receive them within the app. There will also be categories of messages that you may opt-out of, if you choose. If you choose a Persona that doesn't reflect your status at UNI, you'll receive messages for the Persona you selected. For instance, if a faculty/staff member chooses the Student Persona, they will receive student messages. Messages will be moderated through the Office of University Relations, to ensure the volume of messages will be reasonable and the content is pertinent. At the bottom of the mobile app, in the Utility Bar, is a feedback form if you have thoughts, questions or ideas about the MyUNI mobile app. Your feedback will go straight to the development team. Also in the Utility Bar is the Settings button, providing access to change text size, Persona choice, and Push Notifications settings. 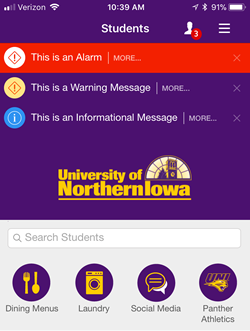 The MyUNI mobile app is available for both tablets and smartphones in native versions. Be Well - Explore the wellness options on campus. Bus Routes - See where the Panther Shuttle is at, as well as all of the other Met Transit bus routes. Calendar - There's a lot to do every day at UNI. Keep track of all the events on campus with the calendar. Campus Maps - Find your way around campus with our online map. Dining - Discover what's cookin' at Piazza, Rialto, Prexy's, 23rd St. Market and other UNI dining sites, as well as their hours of operation. Directory - Access the UNI directory to find contact information for students, faculty and staff. ELearning - Access your online course materials through the eLearning mobile app from Blackboard. Emergency - Find emergency phone numbers quickly. Family Weekend - See all of the Family Weekend activities and information. GBPAC - Explore the great shows at the Gallagher-Bluedorn Performing Arts Center. Graduation - Get all the details for graduation, both for graduates and their guests. Homecoming - Activities, schedules and photos of the UNI Homecoming celebration. Laundry - Check the status of the washers and dryers in the UNI residence halls. News - Find out what's happening at UNI through our news feed. Northern Iowan - Download and link to the Northern Iowan newspaper app. Office Directory - Find addresses and other contact information for UNI department and program offices. Panther Athletics - Follow your favorite Panther sports teams. Rod Library - Visit the Rod Library mobile site for access to many other online services provided by the library. Social Media - Check out life at UNI through Facebook, Instagram, Twitter and YouTube. 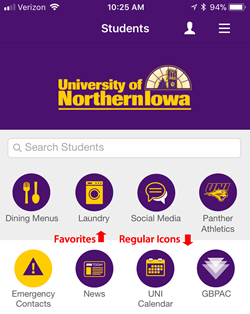 Traditions - Download and link to the UNI Traditions app. WRC - Visit the Wellness-Recreation Center site for hours, facilities, services and more.